With many thanks to Nick Tusa! Got a panicked email from Nick Tusa in December 2017. 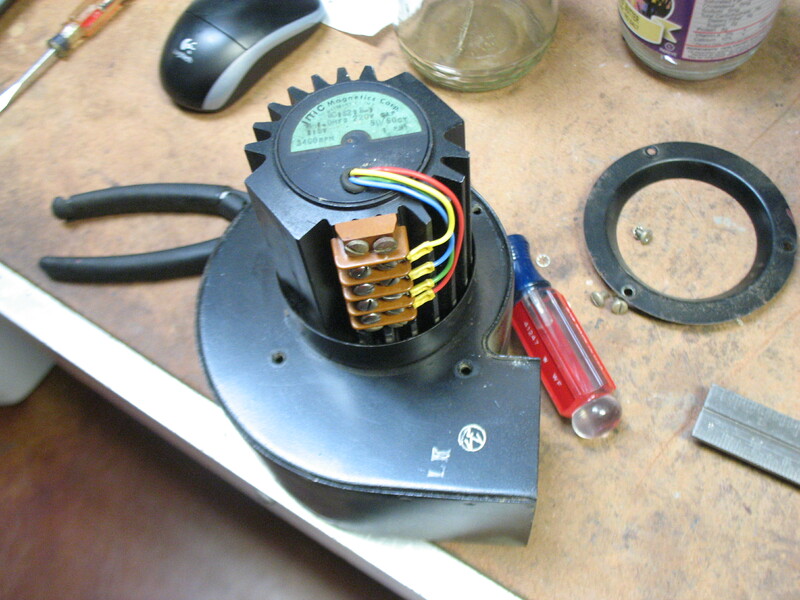 Whilst trying to bring his GPT-750 back to life, he discovered that the cooling fan in the PA assembly was frozen. It appeared to be impossible to take apart, so... what to do?? 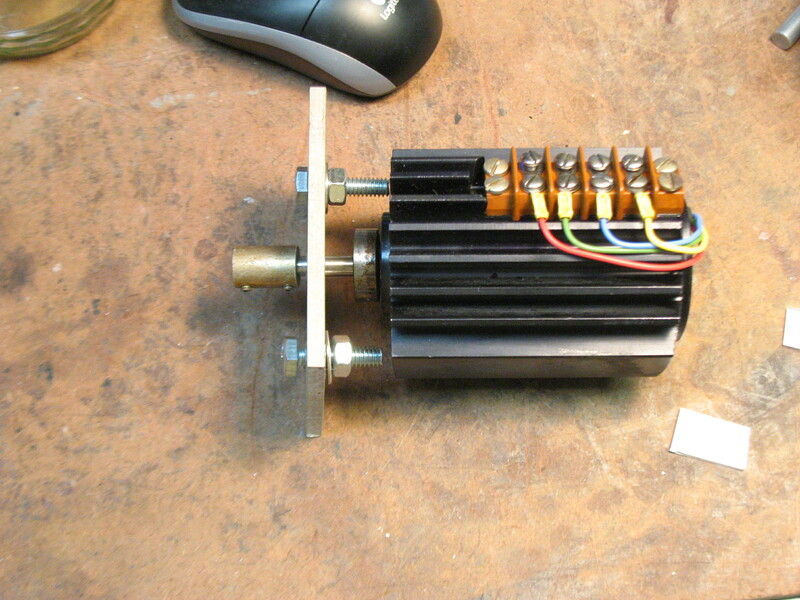 The GPT-750 fan motor dilemma is solved. The front bearing was shot and lumpy..the back one okay. Of course, they are two different sized bearings. But found both on Ebay, which saved me a trip across Lake Ponchartrain and a visit to New Orleans to find said bearings. The front end of the assembly is held in place by a circlip. So, out it came as we tightened up the two puller screws. Then used a small gear puller to remove the bearings from the armature shaft. So, folks, file that one away in TMC restoration hints and kinks. Boatanchor People will stop at nothing to preserve Radio History! 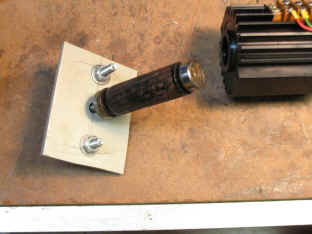 Loosely install the homebrewed armature puller. That means unscrewing the two bolt nuts and adjusting the end shaft extender to take up a good portion of slack. In small equal increments, starting tightening the two nuts, which will take out any slack and will slowly pull the bearing/armature assembly out of the motor. It should come out fairly easily. Using some thinner and a few long cotton swabs, clean out the back recess for the rear motor housing. You will note that there is a small recess where a the back bearing would normally reside. This must be clean in order to properly reinstall the armature. Use a small bearing puller and remove the front/rear bearings. This is available from Sears…theirs is termed for use in removing car battery terminals, but in reality it is just a gear puller. Order two replacement bearings from a local auto bearing shop or via eBay. The part numbers are NDH 77R4A and NDH 77037. Offending fan motor removed from rig... After removal of fan shroud and blade, homemade puller is attached to motor, per step 2 above. Armature successfully pulled from motor housing, per step 3 above. This motor turns out to be the same size and shape, and has the same mounting arrangement and shaft size as a modern-day standard HVAC motor. A Dayton model 4M092 appears to be a near-perfect replacement. It's a 1/65th HP motor that operates directly off 120VAC (no capacitor required), 3000 RPM, CCW rotation, with 1/4" flatted shaft. You'd have to cut the shaft to the correct length, and remove the mounting studs at the rear end of the motor, but other than that, this would be an easy replacement!